A Holland America cruise ship arrived in Seward Sunday morning with a dead fin whale draped against its bow, according to the National Oceanic and Atmospheric Administration. 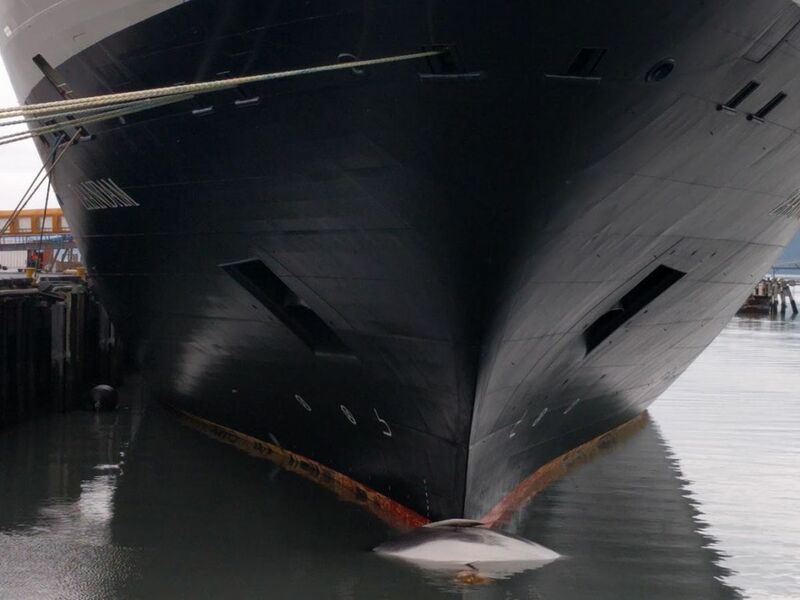 Crew members discovered the dead whale just as the massive Zaandam cruise ship was preparing to dock in Seward at 5:06 a.m. Sunday, Holland America spokeswoman Sally Andrews wrote in a statement Sunday. It appeared to be lodged on top of a bulbous part of the bow just under the water. "We were saddened by this event," Andrews wrote. After the whale was reported, investigators from NOAA and members of the Alaska Marine Mammal Stranding Network and Alaska SeaLife Center were dispatched to the scene, said NOAA spokeswoman Julie Speegle. Initially they believed the animal was a juvenile humpback whale, but it was ultimately identified as a fin whale, Speegle said. It's too soon to say whether the whale was killed when struck by the ship or if it was already dead when it became lodged on the bow, Speegle said. Investigators will remove the whale and send it for a necropsy with a veterinary pathologist. Large numbers of fin whales were found dead in the Gulf of Alaska last summer. Scientists haven't conclusively determined what's responsible for the unusual whale mortality event, Speegle said. In Sunday's case, the fin whale was likely struck in Resurrection Bay. The whale was not there when an officer was putting out a platform to prepare for mooring in Seward's harbor at 4:36 a.m., Andrews said. Holland America has a comprehensive "Whale Strike Avoidance program," according to Andrews. "Our ships have clear guidelines on how to operate if whales are sighted nearby, which include altering course and reducing speed as required," she wrote. "In this case we were not aware of any whales in the area." The Zaandam is a 61,000-ton ship that's longer than two and a half football fields. It was scheduled to be carrying 1,432 passengers and 615 crew members upon arrival in Seward. The ship was coming from Glacier Bay National Park, according to a ship itinerary. Fin whales are currently protected under the Endangered Species Act. If the boat was not harassing or chasing the whale and didn't intentionally strike it, the owners are not likely to face repercussions. Whale strikes are uncommon but not unheard of in Alaska. Nearly 10 years ago, on Aug. 19, 2006, a Celebrity cruise ship pulled into Seward with a 25-30 foot long humpback whale pinned to its bow. Crew members said they believed they'd snagged the whale somewhere near Yakutat. As of 4 p.m. Sunday, the whale was still on the bow of the ship.